ANCHORAGE, Alaska (AP) — The oldest son of former Alaska Gov. Sarah Palin will spend a year in custody after a judge ruled Wednesday that allegations of hitting a woman on the head disqualified him from a therapeutic program for veterans tied to a separate assault case. Track Palin, 29, has been accused of three attacks on people close to him over the past few years, the most recent coming last week against a female acquaintance. Palin, an Army veteran who served a year in Iraq, entered a program intended to rehabilitate veterans after he was arrested in an assault on his father less than a year ago. Anchorage District Court Judge David Wallace told Track Palin that he violated conditions of a plea agreement in the earlier case and must report to a halfway house at month’s end. Before Wallace issued his decision, Palin said he appreciated the opportunity to participate in the program in Anchorage. He acknowledged it was a challenge taking part because he had to come in from the Mat-Su Valley, about 45 miles (72 kilometers) away. Palin attended the hearing with his father, Todd Palin, who also spoke briefly in court, saying he wished his son would be allowed to remain in veterans court. 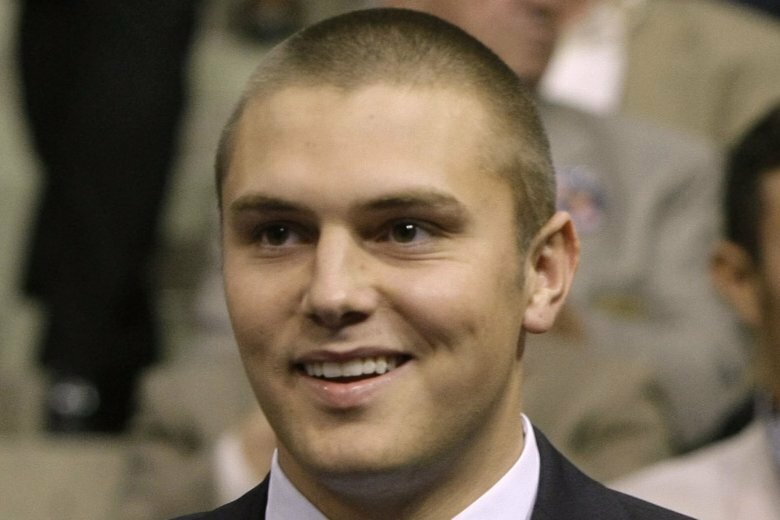 Track Palin was arrested Friday night after a female acquaintance said he told her that she could not leave his house in Wasilla, took away her phone and then hit her in the head, according to court documents. The woman said the pair wrestled over the phone and that Palin let her leave after she screamed for help, according to an affidavit by Alaska State Troopers. They said Palin told them that the two were arguing over how they said goodbye and that any injuries the woman had she did to herself. Authorities say he also kicked over a table and threw his head back at a trooper as he was arrested. Palin is in jail facing misdemeanor charges including assault, resisting arrest and disorderly conduct. Last December, Palin was accused of breaking into his parents’ home and leaving his father, Todd Palin, bleeding from cuts on his head, authorities have said. He pleaded guilty to a lesser charge in veterans court. Track Palin’s arrangement called for him to serve 10 days in jail if he completed the therapeutic program and a year behind bars if he didn’t.